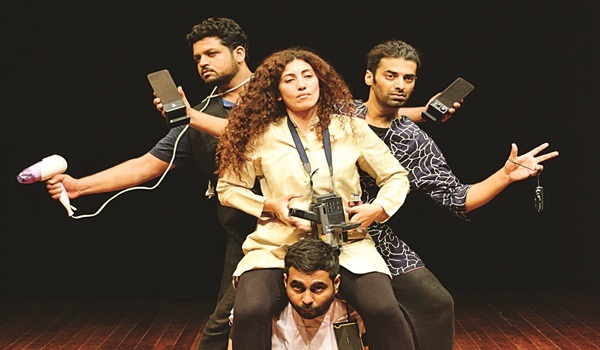 Inviting the audience to break their personal bubbles and engage with reality, Beyond The Bubble is an original play written by Bengaluru-based, Ram Ganesh Kamatham. a�?a�?Beyond the bubble is the real worlda�� a�� this is the line in the script which forms the crux of the play,a�? says Anitha Santhanam, the director. The play is set in 2045, in a post- apocalyptic world. Dealing with the aftermath of the apocalypse, four monks a�� Siddhartha, Gaya, Ibin and Sue are in training in Cloud Monastery. But what remains of the world are the gadgets that captured data digitally, such as mobile phones, GPS tracking devices, and video cameras. The monks are tasked with the job of analysing and understanding the problems that caused the end of the world. a�?The play looks at the whole issue in a humorous way. You are guaranteed a lot of funny moments,a�? says Santhanam. In their quest for the truth, they visit three metropolitan cities. They travel back in time to stop by Mumbai during the 2005 floods, Delhi during the Commonwealth bribing scam, and Bengaluru in 2015, a time when everybodya��s life revolves around selfies. a�?The twist in the play is the entry of the Pandemonium War Rabbits,a�? she reveals. The lives of the monks are threatened by these creatures, which can rapidly multiply in numbers, become invisible, and morph into different shapes. Premiering on the city stage, this play has been in production for over a month. Part of the Jagriti Kids Carnival, the audience will see nine actors showcase their talents on stage. But whata��s the significance behind the name, we asked. a�?Because of our personal digital devices, it feels like we are living in our private bubbles. You can be amongst many people but still in your own world. The idea is to burst that bubble and step out in order to relate to the world,a�? she explains, adding, a�?Each monk has a different orientation. One is a logical monk, while the others are philosophical, inquisitive and compassionate. The four of them look within themselves to find solutions.a�? Designed to give out a social message in a fun way, Santhanam hopes the play will see the audience going back with an awareness of their own choices and how they affect the world at large. a�?The message we want to get across is that one should stop being a part of the herd, and think for themselves,a�? she says in conclusion.